Students at the school are taught in up to five languages. 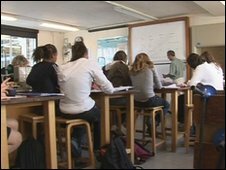 Plans have been announced to bring the European School in Oxfordshire into the mainstream education system. Oxfordshire County Council said it was applying to the government to replace the school with an academy. The school is currently funded by the European Union, but this is being phased out between 2010 and 2017. Under the plan the school would become a specialist language academy sponsored by charitable company Culham Languages and Sciences (CLASS). CLASS said it intends to maintain the ethos of the current European School and it would continue to teach the European Baccalaureate. The school has around 900 pupils between the ages of three and 18. Lessons are taught in English and one other European language, building up to 4 or 5 languages by the time pupils are 16.